The ExoMars 2016 mission consists of the Trace Gas Orbiter and the Schiaparelli entry, descent and landing demonstrator module. The Schiaparelli module will have two heat shields, front and rear, to protect the capsule during its descent through the Martian atmosphere. 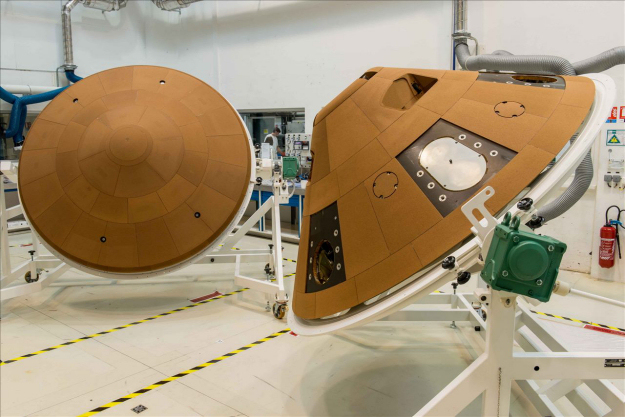 The heat shields have been developed by the Space Systems teams at Airbus Defence and Space, primarily at its site in Saint-Médard-en-Jalles, near Bordeaux (France). This photo of the two heat shields was taken during the final phase of production. The Schiaparelli's front shield, to the left in the photo, has a diameter of 2.4 m and weighs 80 kg. It is made up of a carbon sandwich structure covered with 90 Norcoat Liège insulating tiles. During the atmospheric entry phase, the material is built to withstand temperatures of up to 1850°C before being jettisoned. The rear shield, to the right in the photo, weighs a mere 20 kg and is composed of 93 tiles of 12 different types, affixed to the carbon structure. It also will contain the parachute to be deployed during the capsule's descent.